"You can’t manage what you don’t measure." Dave Maddaluna, Chief Financial Officer, has been with DELTA |v| since 2015. Dave is responsible for all reporting and analytics around company performance. Specifically, Dave’s duties include reporting on profitability and key performance indicators for the industry, as well as designing and delivering the company’s budgeting and forecasting capabilities. A big part of Dave’s role is also to support DELTA |v|’s expansion of geographies and human resources from a cash flow and capital perspective. He also provides strategic support to Brian on projects that impact company financial performance, reduce operational risk, and enhance DELTA |v|’s corporate reputation. 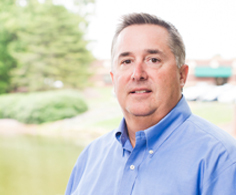 Dave has worked in finance since graduating with his Bachelor’s of Arts in Finance and Accounting from James Madison University. He also earned his MBA with a concentration in finance and entrepreneurship from the University of North Carolina at Charlotte in 2001. He also holds his Six Sigma process improvement certification and applies the tactics of the program to processes at DELTA |v|. He has experience in the banking industry, marketing and financial consulting and applies this knowledge to his work at DELTA |v|. Dave is just as competitive in his personal life as he is in his professional life. He is a longtime coach for his daughter’s travel softball team. He also manages the Carolina Elite softball organization, one of the premiere softball organizations in the Southeast. He enjoys the competition and quality family time the activity provides. In the off chance that he’s not on a softball field, he hopes to be on a golf course, on the ocean deep sea fishing, or on a vacation with his wife and four children.